Like most businesses, yours has probably grown up organically over its lifetime. And similar to most organic structures, your organization will have its particular details and quirks which make it unique. As it gets bigger still, systems change. There probably won’t be a single customer-facing element to your business; instead, there’ll be several: marketing, customer care, sales teams, etc. Each of these departments is effectively talking to the same people, but they may not, ironically, be doing much talking to each other. Like the different customer-facing departments, manual procedures and outdated IT systems will probably ensure that the workforce as a whole collaborates badly. Valued customers are cold-called by accident, invoices go unpaid, leads missed, and information is spread across a smorgasbord of Excel sheets, emails, local files and cloud services. The bespoke nature of the way enterprise (and its constituent parts) works can be united, however. 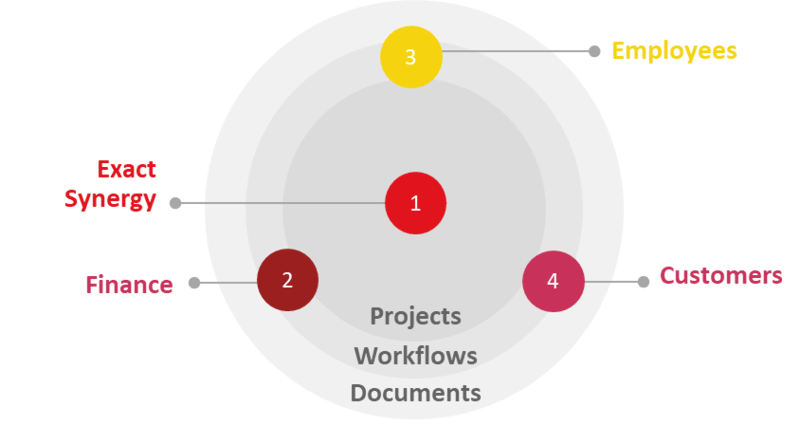 This is typically achieved by having a workflow-centric software solution that works the way you already do – but better! Synergy, a cloud-based business management solution from Exact, is the best way to link multiple departments’ working methods, free up staff time and remove legacy system overheads. Resources, projects, people, data, and collaborative tools can all work seamlessly on this one platform – without the platform dictating to its users quite how they should work. By modeling work flowing through your company by projects, workflows and data, Exact Synergy becomes a reflection of your business, but one that’s more efficient. And, what’s more, it’s available in the cloud (so few overheads), and it’s not an all-or-nothing product: companies can start small and add functions as they go along. At the most granular level of any enterprise is the raw data which makes up the elements of the working whole. Information is in a mixture of PDFs, Word document, emails, databases, printouts and even whiteboards full of scribbled ideas from planning meetings. By unifying data into a single, central repository, there’s no duplication, no need for double entry into two (or more) systems and no information ever gets lost (or printed, filed and forgotten). Data and documents, then, can become part of a moving flow of work through the company. Ancillary services such as HR, finance and marketing also use the same resources rather than having to develop their own data silos and business processes. The integration, for instance, of the Microsoft Office suite with document management systems is a good first step. Email is ubiquitous, but hopeless at document archiving and management. A better solution, in the form of Exact’s Synergy, lets all users across the enterprise file, tag, search, and collaborate on any document and message, from one interface. It’s in specific, essential departments which Exact Synergy excels. In HR, for example, employee and manager self-service frees up hours currently spent re-entering data from paper forms, emails, spreadsheets or proprietary HR software. In Synergy, staff can quickly post job descriptions & requirements to attract applicants, manage resumés, create interview events, track offers and even archive evidence of applicants’ qualifications and letters of application. On-boarding is similarly smoothly handled, and on-going training and personal development processes are treated in the same way, with staff signing up to courses themselves, and their attendance posted to HR records. In sales, marketing, and customer service, staff should work from the same page. With Exact Synergy, the CRM removes isolated silos of information, so that, for instance, marketing knows when sales staff want to begin to push a new product. Collaboration and alignment produce excellent results, every time. The modular nature of Synergy means any solution can be strengthened by the opportunity management module. This uses the central database to unite marketing professionals to sales teams, passing leads from outreach campaigns to the people who can close deals. In the finance department, electronic workflows can route invoices to the right personnel for self-service approval – right throughout a multi-continent organization. And staffing-heavy activities in finance like month-end and financial end-of-year can be automated, so closing a month becomes a matter of a few clicks, rather than days’ of work. Because all financial data is centralized, rather than spread across individuals’ and groups’ scattered spreadsheets, it’s simple to generate even complex reports, and, by moving finance to a more strategic role, sophisticated business intelligence can be gathered quickly and shared with the right people. To turn your organization into the unified, well-oiled machine it can be, and to enable it to take the next steps up to bigger and better things, be sure to take a long look at Exact’s cloud-based Synergy software. It eliminates internal barriers and unifies data & processes. When people and structure allow collaboration, the results are overwhelmingly positive. To see for yourself, get in touch with an Exact representative in or near your country, today.